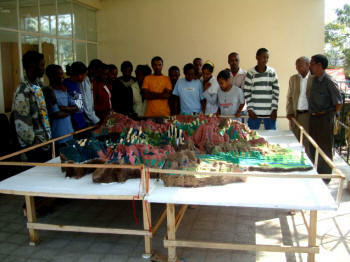 This 1:180,000 scale Participatory 3D Model (P3DM) characterised by 10 x vertical exaggeration represents the Southern Nations, Nationalities, and People’s Region, Ethiopia. Ti was manufactured in June-July 2010. 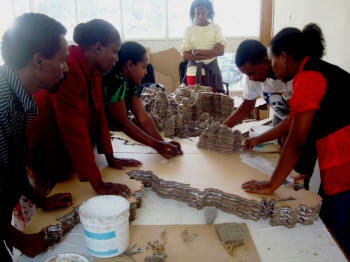 The model measuring 3m x 2.5m or an area of 112.343 km2 on the ground, is the 5th Participatory 3D Model constructed in Ethiopia. 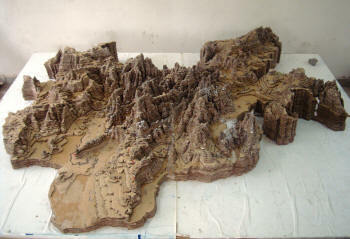 The highest elevation on the model is Mount Guge in Gamogofa with 4207 m a.s.l. 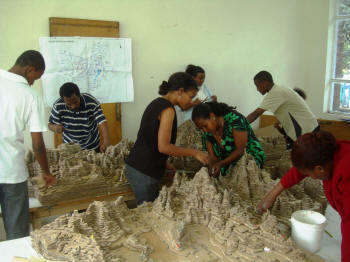 The exercise has been organised by the “Managing Environmental Resources to Enable Transition to more sustainable livelihoods” (MERET) project to raise awareness among policy makers and government officials on the potentials of community-based participatory watershed development (CBPWD). 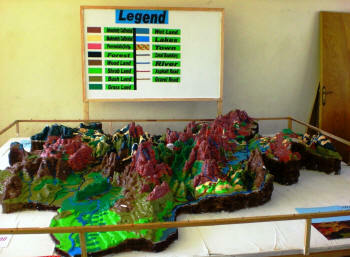 The project has demonstrated the effectiveness of CBPWD in reducing soil erosion, rehabilitation of gullies, harvesting rainwater and restoring land productivity in such a manner as to produce substantial community and household assets that provide the basis for increased agricultural production and food security. 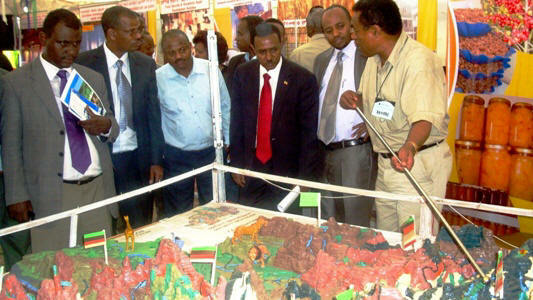 According to project implementers, the P3DM process has been quite effective in raising awareness on the issues related to watershed degradation and has been used to raise awareness on the issues at stake in the Region. A joint venture between the Ethiopian government and WFP, the MERET programme gets chronically food-insecure communities involved in environmental rehabilitation and sustainable income- generating activities that improve livelihoods. The long term objective of MERET is “to improve livelihood and food security opportunities for the most vulnerable and in particular women headed households through the sustainable use of the natural resource base “. 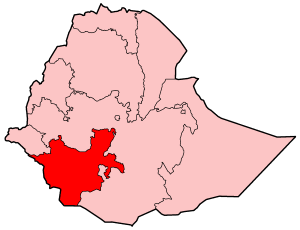 In the Southern Nations, Nationalities, and People’s Region (SNNPR) the MERET project operates in 6 zone or 12 woredas over a total area of 118,280 ha.